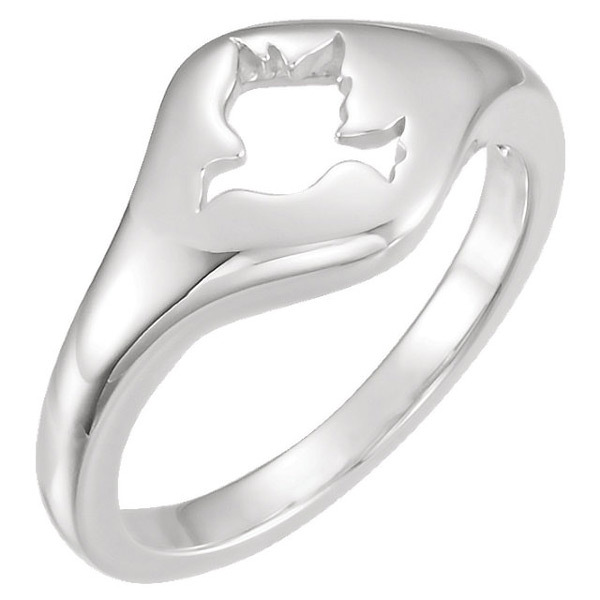 A stylish and cute women's cut-out Dove Holy Spirit Ring for Women in 14k white gold, from Apples of Gold Jewelry. The top/face of this unique women's Christian ring measures 10.5mm in size (between 3/8" and 7/16") and the ring weighs approx. 4.77 grams in 14k white gold. This ring is also available in 14k yellow gold and sterling silver (shown below). "But the Comforter, which is the Holy Ghost, whom the Father will send in my name, he shall teach you all things, and bring all things to your remembrance, whatsoever I have said unto you" (John 14:26). We guarantee our Women's 14K White Gold Cut-Out Dove Holy Spirit Ring to be high quality, authentic jewelry, as described above.